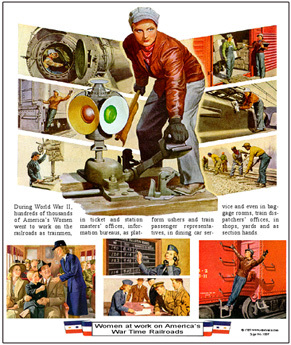 During World War II, Americas Women served their country in many ways, and working on the railroad was one of them. This beautiful tee salutes the great work and sacrafice Women gave to their Country including my Mother. 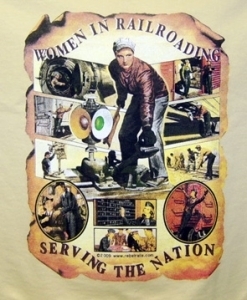 Beautiful tee saluting the great work and sacrafice Americas Women gave during World War II. Thousands of Women took the place of railroad men who were off to war. Unique tin sign of an advertisement used by the Pennsylvania Railroad celebrating Women in railroading during World War II.